GG Musings: Major Dress Haul from eBay! This is my second to last post about my early October shopping binge. I often browse clothing on eBay and when I noticed one seller was selling a ton of Pepperberry/Bravissimo dresses in my size I instantly thought combined shipping costs! The majority of Bravissimo clothing on eBay is located in the UK which means that any item I buy comes with an additional $20 international shipping charge to get it to the USA. So, the ability to buy multiple dresses shipped in one package was beyond appealing. At one point, I was bidding on ten different dresses from this seller! I ended up winning 5 dresses: 1 from Bravissimo, 3 from Pepperberry (Bravissimo’s former label) and one from the British department store Marks & Spencer. 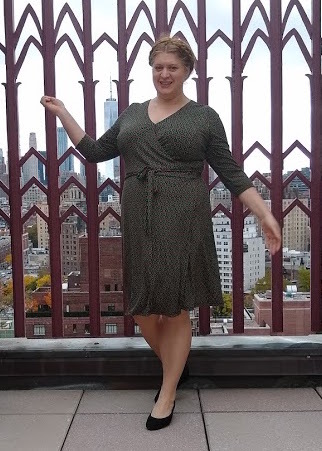 The Pepperberry/Bravissimo dresses are all size 18RSC (14RSC in US sizing) and the Marks & Spencer dress is a British 18. My current measurements are 47.5-39-45. None of these styles are currently available, however the fit can still give you an idea of what might work for you in Bravissimo dresses. The Marks & Spencer dress is not designed to be bust friendly, but the smocking at the empire waist does work on me. The smocking comes up a little on the edge of chest so not a perfect fit but still super cute. I don’t see a lot of cleavage in New York City but I definitely will be wearing this next summer when I head back to Los Angeles for my cousin’s wedding. The next dress is also a summer dress. I love the rainbow smocking at the waist on this one. 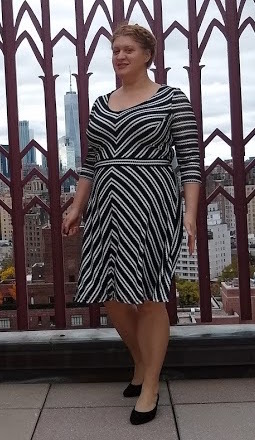 It’s a bit longer than newer Bravissimo dresses – which I love because I ride the subway every day and prefer a longer dress for this. This is definitely a keeper and going in my bottom dresser drawer for next summer. For the next dress, I actually thought it was this dress still available on the Bravissimo website. My sister and I tried this dress on last spring and both liked it. The dress I ended up winning is similar with a lace overlay. This dress came new with tags and is supposed to be my sister’s Christmas present. I selfishly hope it is too big for her so that I can keep it! I’m working on wearing more prints since I have a lot of black dresses. This dress reminds me of Mary Richards on The Mary Tyler Moore Show and I love that about this dress! I used a safety pin to keep the top closed. The safety pin is not the best option and I will probably end up tacking the top part of the dress closed with stitches in a few places. Last up is my newest dress love! I love the cut of this dress and the colors! The style is amazing – it fits in the hips, has a bit of fullness in the tummy area and the empire waist hits at the smallest part of my body. I definitely need to campaign Bravissimo to make more dresses in this style. I also think it will work for winter with my belted cream colored cardigan and favorite boots. This was definitely a great dress haul. In total I paid $170.31 including shipping which breaks down to $34.06 per dress. Given that Bravissimo dresses generally cost over a $100 this is definitely a good deal! Do any of you ever buy clothing on eBay? 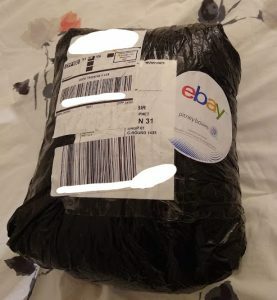 1 Comment on GG Musings: Major Dress Haul from eBay! Love the reviews with pictures, lots of great info!